Fall is here. I actually needed to throw on a cardigan this morning to go outside. For the last few months, I’ve only needed one inside because my office is frequently arctic. It must be better for the books. Or they’re secretly housing penguins on Deck C. I think I’ll keep believing that—specifically, penguins in early modern costume. Adorable. I’ve been stockpiling at least some of the last few weeks’ worth of squash and eggplant for pickling and finally got around doing that over the weekend. After suffering from some kind of chest cold that wiped me out for two weeks, I’d accumulated a whole lot of food in the fridge. Friday night was pickle-fest, and Saturday was apple-pear butter day. Fridge clean, pantry full, life good. -Combine all ingredients except the squash and eggplant in a large saucepan over medium-high heat and bring to a boil. Add the vegetables and return to a boil for 10 minutes. -Using a slotted spoon, pack the vegetables into warm, sterilized jars, leaving ½ inch headspace. 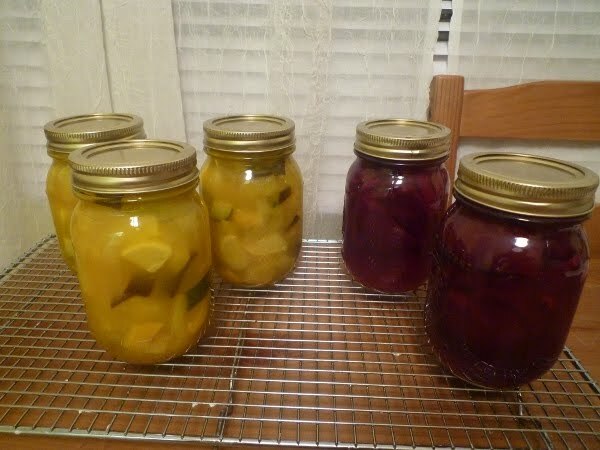 -Add enough of the pickling liquid in the saucepan to cover the vegetables in each jar. -Secure lids and rings onto jars and process in a boiling water bath for 10 minutes. -To prepare the beets, scrub them gently and then boil for 20-40 minutes or until just tender. Rinse with cool water. Slide off the skins and quarter or halve depending on the size. -In a large saucepan, combine the rest of the ingredients and bring the mixture to a boil over medium-high heat. Reduce the heat slightly and boil gently for 15 minutes. -Add the beets and return the mixture to a boil. -Using a slotted spoon, pack the beets and onions into jars leaving ½ inch headspace. 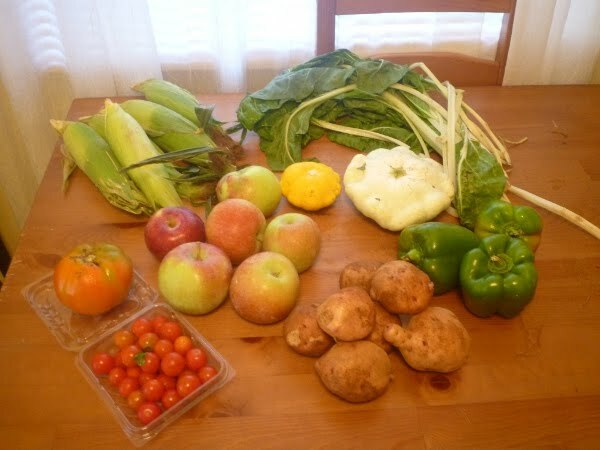 Tomato, cherry tomatoes, squash, sweet corn, apples, potatoes, green peppers, and swiss chard. The cherry tomatoes are so sweet. I had some in a wrap with black forest smoked turkey and provolone cheese from the deli and it was such a delicious contrast. Joe’s folks are away at the beach for the weekend and have absconded with our dog. Yes, that’s right, he gets a vacation from his difficult life of being spoiled. But that does mean that Joe and I can go out after work on Friday without one of us having to run home to Virginia first. And I can cook squash without a pouty face staring at me begging for some (he is weird). Cool.